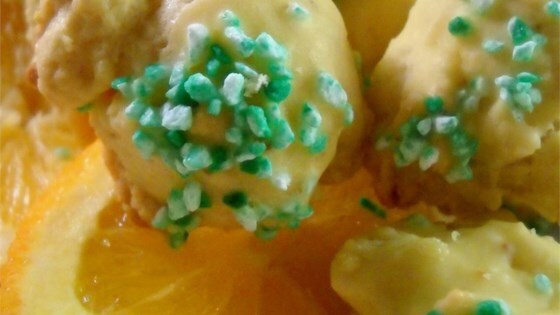 "A delicious soft, cake-like citrus cookie typically made at Christmas time. Goes great with a cup of tea!" In a large bowl, cream together the margarine and white sugar until smooth. Beat in the eggs one at a time, then stir in the vanilla and orange juice. Sift together the flour, baking powder and baking soda; stir into the orange mixture. The consistency will be thick and sticky. Drop dough by teaspoonfuls onto the prepared cookie sheets. Bake for 10 minutes in the preheated oven, or until golden. Cool on wire racks. In a small bowl, stir together the confectioners' sugar, lemon juice and milk until smooth. Dip the tops of cooled cookies into the icing, then into sprinkles. Let stand until set. I added a bit of lemon and orange zest for color and flavor. I think next time I'll add just a tad more sugar but these made a GREAT cookie cutter dough!